Quad Fuels Heads into THIRD Year of Trading! Well, what a busy Christmas and New Year we have had here at Quad Fuels Ltd! Our brand new starter, Josh, has quickly become a part of the Quad Fuels family. Josh is based in our Colwyn Bay offices and will be helping to develop the business by taking your calls, payments, queries, whilst bringing his vast knowledge of the local area. 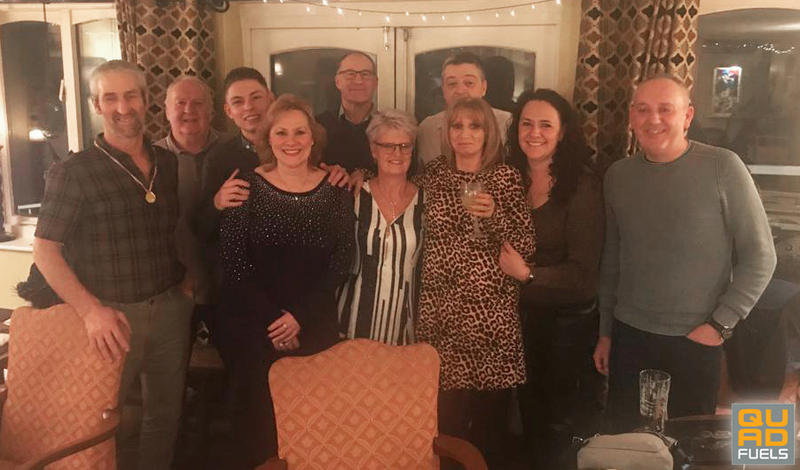 In other news, the entire Quad Fuels team had such a fantastic evening at The Three Pigeons Inn in Graigfechan for our well-deserved staff night out. We also happened to be celebrating our SECOND anniversary, and the fact that we are heading into our THIRD year of trading! We cannot believe how quickly the time has gone by; however, we do know that our busy schedules and happy customers have certainly made each year incredibly enjoyable! We would also like to take the opportunity to thank Paul and Debbie of the Three Pigeons Inn, for being such fantastic hosts and providing us with absolutely gorgeous food and a wonderful atmosphere! Highly recommended 5 star service! We are all looking forward to 2019; delivering our quality domestic fuel and services to our returning customers, as well as welcoming all of our new customers! Contact the team today to discuss your next fuel delivery, and let us try our best to make your fuel costs as cheap as possible!